Most car safety features today were once extra-cost options. A low cost-to-benefit ratio makes a feature more likely to become standard on all cars. Not all safety features are equal. Virtually every car safety feature standard on today's vehicles began life as an extra-cost option. Equipment we regard as quite commonplace today, such as airbags, anti-lock brakes, back-up lights, electric windshield wipers, rearview mirrors and so on, were cutting-edge features at some point in automotive history. Seat belts, for example, were optional on only a few American cars by the late 1950s. It took an act of Congress to make front seat belts standard equipment in the mid-1960s. By 1970, seat belts in the backseat were standard as well. Today seat belts have evolved into the 3-point harness variety that automatically contract when unbuckled, and many automatically cinch tighter in a collision. Some safety technologies take more time to find wide acceptance than others. Heads-up display (HUD), projecting critical information on the windshield in front of the driver to minimize the time his eyes leave the road, has been optional on some models since the late 1980s. Today it remains an option and only on a handful of models. In contrast, in 1995, Mercedes-Benz was the first to equip a production model with electronic stability control (ESC). Working with the anti-lock braking system, ESC is a computerized system that applies appropriate braking to reduce skidding and keeps the vehicle on its intended course. Every 2012 model-year car sold in the United States has ESC as standard equipment--just 17 years after Mercedes-Benz introduced it. Examining today's crop of optional car safety features, a number seem headed for widespread acceptance. Not only do they seem worth their extra cost as options, but some may well become standard equipment in the future. Here are five safety options rated from 1 (unlikely) to 5 (very likely) for their likelihood of becoming standard equipment on all cars in the not-too-distant future. At first blush, having a rear-mounted camera providing the same view a driver can see looking over his shoulder seems like a frivolous bit of techno-wow, but it's the blind spot where objects such as bicycles, small children, the neighbor's cat or other assorted hazards can lurk. The larger the vehicle, the larger the blind zone, which can stretch as far as 50 feet behind a full-size truck or SUV. According to the Web site KidsandCars.org, every week cars and trucks back over an average of 50 children; two are fatalities. Most of these incidents take place in parking lots and residential driveways. A back-up camera eliminates that blind zone. Lumped in with the navigation system or other package, back-up cameras typically aren't stand-alone options. Some systems, however, go without the touchscreen and instead use the rearview mirror as the monitor, as do the increasing number of aftermarket back-up camera systems. 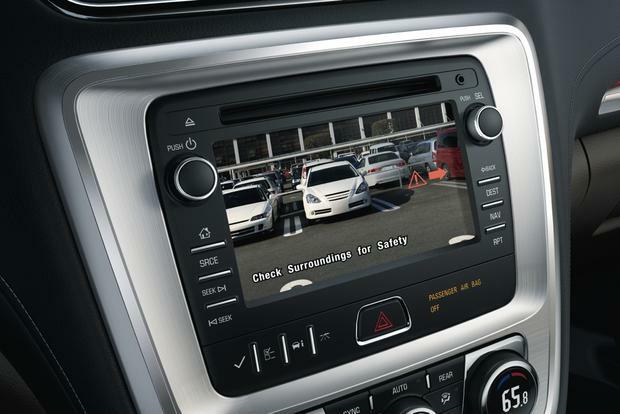 For the same reasons back-up cameras can reduce accidents, parking sensors are valuable safety tools. Whether mounted in front or in the rear, these radar-based sensors detect when the vehicle approaches a hazard and issue a warning beep. Rear-parking sensors are a $295 option on the Ford Fusion. A low cost-to-benefit ratio will drive acceptance as a standard feature on all cars. Using radar-based technology, like that employed by adaptive cruise control, forward collision warning senses when a vehicle is approaching another vehicle or a fixed object at a speed fast enough to crash into it, and alerts the driver that a collision might be imminent. More advanced systems automatically apply the brakes to avoid a crash. Most of us think we are pretty competent drivers, and the idea of such a system seems rather unnecessary. We'd see the danger on our own and take proper action, right? According to the Insurance Institute for Highway Safety (IIHS), not always. In fact, the IIHS cites studies revealing that loss claims are down 14 percent for front-end collisions among vehicles from Acura, Mercedes-Benz and Volvo that were equipped with a forward collision warning system with automatic braking. Taking seat belts to the next level, Ford introduced inflatable seat belts as an option in the second-row seats of a few of its larger vehicles. Ford claims that under normal use these belts are more comfortable and more likely to be used than conventional belts. If true, this alone is a pretty good argument for making them standard. But it's in a crash that their value becomes clearer, as they deploy and spread the force of a crash over an area of the body that's five times greater than a traditional belt, further reducing the likelihood of injury. Having the crash force absorbed over a larger area is particularly beneficial when the wearer is a child or elderly person. Ford intends to increase this option's availability to more models worldwide in the near future. In addition to their potential to reduce injuries, what makes inflatable seat belts seem a likely candidate for becoming standard on all cars is their relatively low cost. They are a $190 option on the Lincoln MKT and a $195 option on the Ford Flex. Responding to the steering wheel, adaptive headlights pivot to illuminate curves in the dark. Basically, they light up the area where the vehicle is heading instead of where it is currently pointed. A number of carmakers, such as Mercedes-Benz, Mazda, Acura and Volvo, offer models with adaptive headlights. In studies cited by the IIHS, loss claims are down by about 10 percent for equipped models. This is fairly significant, because only about 7 percent of crashes happen between 9 p.m. and 6 a.m. Although a number of carmakers are working with adaptive headlights, they add roughly $850 to $1,000 to the bottom line, and are unlikely to find their way into entry-level cars any time soon. What it means to you: Choosing optional safety features can come down to getting the most bang for your buck. So back-up cameras, parking sensors and inflatable seat belts are no-brainers.